I've updated my gldsim.lua Glider Simulator script with a new look, a new feature, and compatibility with all of the "Taranis" line of FrSky/OpenTX radios running OpenTX version 2.2, while maintaining compatibility with OpenTX version 2.1. OpenTX: Export your calibration settings and then import them into another model. This is an extension of a discussion that started somewhere around here. It's a mix script that will convert a horizontal output and a vertical output into a pair of outputs that are confined within the boundary of a circle. Stick input that falls outside of the circle will be clipped. if R > 1 then -- clip. If you're working on a way to accomplish this without Lua then this is what you're trying to duplicate. I don't think it can be done but I could be wrong. Download circle.txt, rename it to circle.lua, and store it in SCRIPTS/MIXES. 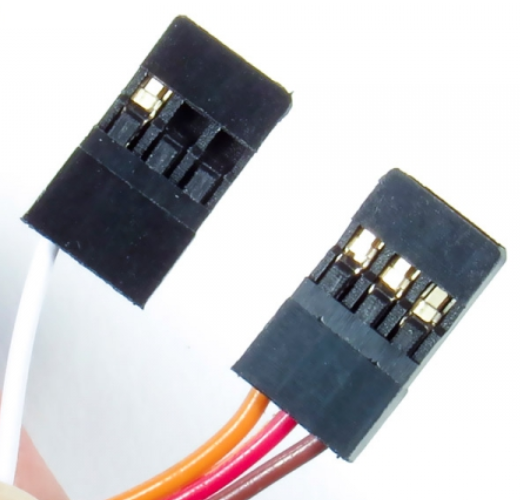 I like the Castle Creations Phoenix Edge ESC's auxiliary input with the white wire. For my ALES sailplanes I programmed mine in the RX ARM LOCK mode so that Channel 8 on my receiver operates the motor safety lockout. It plays a little tune through the motor when I arm it and a different tune when I disarm it. I also have ALES CAM limiters installed, which I leave active at all times, even for practicing and sport flying. Since the recommended CAM Limiter hookup routes the entire plane's electrical power through the limiter, its cables, and connectors, which is an arrangement that I don't like, I instead swapped the orange and white wires on my ESC so that the orange throttle signal wire is alone on one plug and the white aux wire, red (+) wire, and brown (-) wire are together on the other plug. There may be some interest springing up in Germany in the Shepard Tone Vario setup that I developed for OpenTX earlier this year. See my Shepard Tone Vario for OpenTX and Shepard Tone Vario testers wanted posts from February and March of 2018. Here's the complete package with setup instructions. Edit: According to this post, the RC Soaring Digest has released its final issue. My Shepard Tone Vario setup was inspired by an article by Helmut Stettmaier in the March 2018 issue of the RC Soaring Digest, titled An Innovative Method for Acoustically Rendering Climb Data for Model Gliders Using Shepard Tones, so if you're interested in reading it download it now, just in case the site goes offline. Please post any additions or corrections below. Note: Model Aircraft & Drone Advocacy has many ongoing threads about HR 302. The weights are set at 50% so that the combined effect of the mixes for each channel won't exceed ±100% and cause clipping. That's important because when a channel mix reaches ±100% its control surface is at its limit and any further stick movement away from center won't result in any additional control response from that channel. For a more detailed explanation of this, please see this post, which includes a graphical illustration. However, a 50% weight for the aileron input and a 50% weight for the elevator input isn't necessarily the best combination for a slope wing. The sum of the two weights should never reach beyond ±100%, but that doesn't mean they have to be equal to each other. In the case of my Weasel Trek and generally most other slope wings, the best setup will have a lot more aileron throw than elevator throw. In fact, if the CG is forward of but very close to the neutral point, a wing will require very little elevator throw. On the other hand, slope wings are generally more fun to fly with the quick and snappy rolls you can get with extreme aileron throw. It's customary to precede this type of link with a description of where the link will take you. ← This is a clickable link. Here's a Lua script and custom set of WAV files for OpenTX version 2.1 or 2.2 to speak the time of day in a natural-sounding format, such as "twelve o'clock PM" or "nine oh two AM." The WAV files are in a folder in the root directory named SAYTIME, and saytim.lua is stored in /SCRIPTS/FUNCTIONS/. Beginning with OpenTX version 2.2.1, saytim.lua can alternately be called with a Global Function. local hour, minute, ampm = datetime.hour, datetime.min, "am"
Instructions are included in a file named readme.txt. Please post any problems or special requests below. In November of 2016 I described my SetFail flight mode, which allows you to experimentally determine your best Custom failsafe settings for each of your models, but it's a bit involved and some might consider it adequate to just set the failsafe option to Custom and set all your controls to neutral, except the throttle, which should be fully closed. The values you enter on your Setup page for Custom failsafe are the actual values that will be sent to your servos and do not take into account any Subtrim, Min, or Max settings on your Outputs page, or any mixing, or flight mode-specific trim settings, etc. that occur when your sticks are in their neutral positions. To know what those Custom failsafe values really need to be for neutral control surface positions, or whatever positions you want them to take when control is lost, you have to read them from your Channels Monitor. There's a bug in the trim steps and trim limits in OpenTX that has apparently been around for a long time, and which I reported on Github back in February of 2017. Briefly, trims have a maximum integer value of 250 instead of 256. 256 is 2^8 or two raised to the eighth power, and would be exactly 1/4 of the maximum integer value of 1024, which is 2^10 or two raised to the tenth power. But 250, which is 2 x 5^3 or two times five raised to the third power, is 24.4140625% of 1024. In the midst of a system neatly based upon powers of two, there's an awkward and illogical value that's the cause of a big mess! Here's an oddity that fixing this bug will cure: In any trim step setting beside "Extra Fine" (2 steps per click), the values accessible when you start from zero are interleaved with the values accessible when coming back from maximum or minimum. For example, if your trim setting is "Fine" (4 steps per click) then if you start from zero you can select settings that are multiples of 4, such 4, 8, 12, 16, etc. and from there to their least common physical lower limit in five steps of equal degrees, ending at -100%. ... and a 16-point "stair" curve that's part of my Calibration mode. 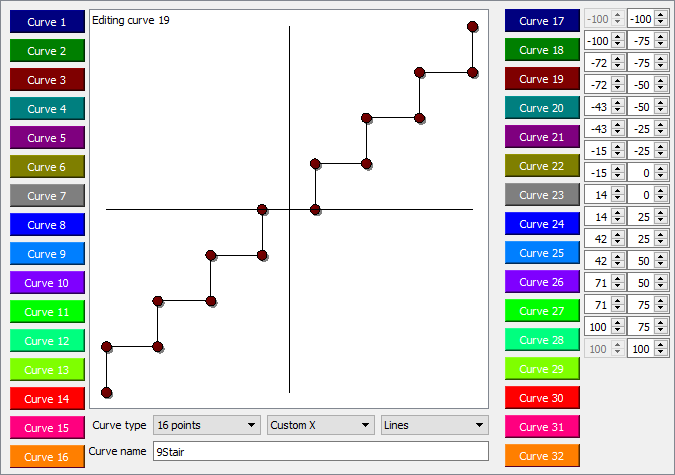 The "stair" curve is an expansion of an idea inspired by Mike Shellim. I need testers for my Shepard Tone Vario. You'll need a glider with an FrSky High Precision Vario or a G-RX8 with its built-in vario, plus an OpenTX radio. Other types of varios might also work as long as they show up on your Telemetry page. I know this works with my Taranis running OpenTX version 2.1.9, and it'll probably work with other types of FrSky radios using OpenTX version 2.2, but I need volunteers to confirm that and to share their overall impression of it. This video shows how easy it is to install and set up. Watch it and then post below if you're interested in trying it out. The Shepard Tone Vario is pretty-much ready and will be released after some of my friends have tested it. Version #1 was an attempt to create Shepard tones using the limited sound capabilities of the playTone() function of OpenTX Lua, but that didn't work out very well. The latest version uses a set of 100 WAV files that I spent many hours creating using a combination of several tools, including Audacity. This will almost certainly undergo further refinement but I believe it's quite functional in its current form. Credit for the idea goes to Helmut Stettmaier, who describes it in the March 2018 issue of Radio Controlled Soaring Digest. Please read his article for more information. Here's a simple improvement to the volume control setup I described in my previous blog post, which is a way to put your volume control on one of your potentiometers and confine its range to within your chosen upper and lower limits. The need to do arithmetic is now gone, plus there's a way to set the detent center position of the control to the "perfect" volume setting that's not too loud and not too soft. If you haven't already guessed, the solution is to use a 3-point curve. Taranis: Tame Your Volume Control! If you're controlling your Taranis volume with one of your potentiometers ("sliders") you might be annoyed that the volume can be accidentally adjusted so high that you get bad distortion, or so low that you can't hear it and you miss important alarms and messages. If the maximum is louder than you want, or the minimum is lower than you want, or both, here's how to confine your volume range within upper and lower limits of your choice. In this example I'll use RS as the volume control, but it could also be LS, S1, or S2. That's pretty simple, but to restrict the range you'll need to make it slightly more complicated. 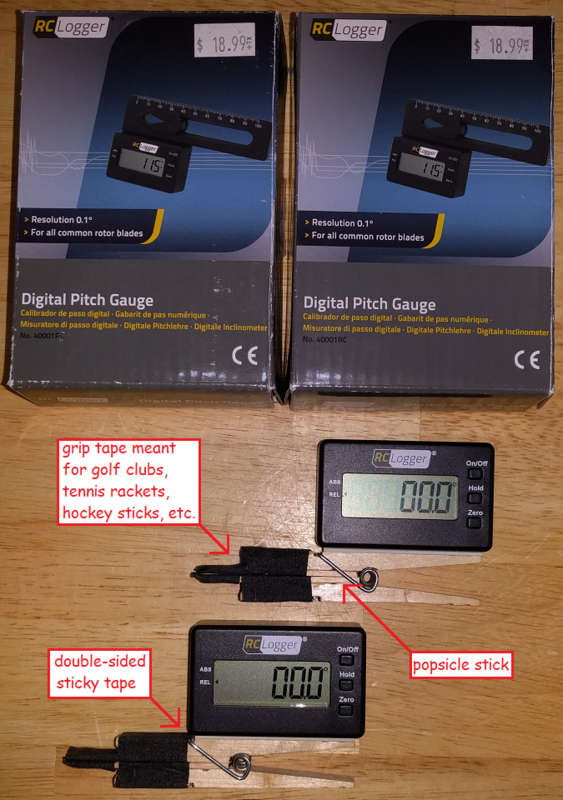 A "fuel gauge" for your telemetry screen to display your LiPo pack's charge state as a percentage of full charge. Update, 11/27/2017: Permission was requested by and granted to Martin Phillips ("thebriars") to include this in the Version 2.2 update of his OpenTX Documentation. Here's a "fuel gauge" setup for your Taranis to display your flight battery's state of charge as a percentage, beginning at 100% for a fully-charged pack and decreasing as you consume battery power. 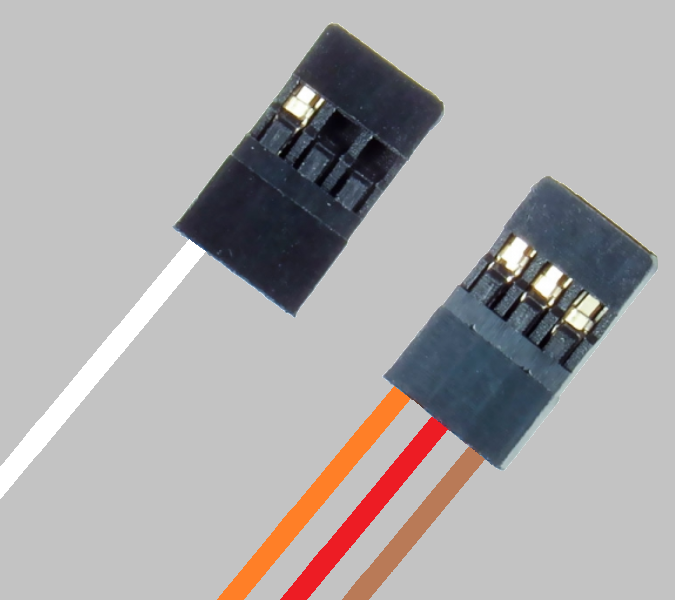 It requires a current sensor, such as a FrSky SP-40A - Smart Port 40 Amp Sensor or FrSky SP-150A - Smart Port 150 Amp Sensor. You'll be able to add alarms and voice announcements that trigger at specific charge states, or at regular time intervals, or each time the charge state decreases by a certain amount so that you'll get announcements at, for example, 100%, 90%, 80%, etc. You'll also be able to bring up announcements whenever you like by flipping a switch. The battery state will be retained between flights even if the radio is turned off, so a switch is provided to reset the charge state to 100% when the battery is replaced or recharged. This setup is known to be compatible with OpenTX Versions 2.1 and 2.2. If you have questions, suggestions, requests, or problems, please post in the comment section below. Begin by configuring the sensor on the Telemetry page. When the aileron stick is moved away from center while the rudder stick is centered, aileron-to-rudder mix is active. If at any time the rudder stick is moved away from center, the mix is automatically cancelled and the rudder stick takes full control of the rudder. The changeover is slowed slightly for a smooth transition. When the rudder stick and aileron stick are both centered, the mix is reactivated. In other words, the rudder is controlled by one stick or the other but never both, and the rudder stick has priority. A simplified eepe file is attached that demonstrates the setup, and if you have glidsim.lua installed in your /SCRIPTS/TELEMETRY folder you'll be able to watch it work. Activate the glidsim screen with the PAGE button. In Companion simulator, use the [Hold X] function to set the aileron stick away from center, then move the rudder stick and watch what happens. Note: Of course the attached eepe file is not meant to fly a real model. It's only for demonstration purposes. Version 1, which needs "NoTrim" added to the aileron mix to prevent aileron trim from affecting the rudder. Download this to see the undesired effect of leaving out NoTrim. Like my other scripts so far, volume.lua is implemented like a telemetry script but doesn't actually provide telemetry. (But in this case it could with modification.) What it does is provide a way to adjust volume and store the setting without using any of the switches, knobs, or sliders that are otherwise used to control your model. Instead, the buttons next to the display are used. The script needs one global variable ("GV"), which you can name "Volume." It can be any one of the nine global variables in each of your model memories and can even be a different GV for each model, although that would require multiple copies of volume.lua with minor changes to each copy and different filenames. I'm using GV1 in my radio and in the examples that follow. There are installation instructions embedded in the script but I'll post more detailed instructions here. Download volume.txt from the link below, edit it as needed, rename it to volume.lua, and store it in SCRIPTS/TELEMETRY on your SD card. A follow-up post will display the script so that you can copy and paste it into a text editor if you wish. 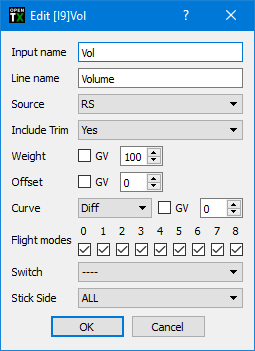 The GV that you use for volume control needs to be set to "Flight mode 0 value" in flight modes FM1 through FM8. gimbtest.lua is designed to run as a telemetry screen, although it doesn't actually provide telemetry. It checks each of the four stick functions, throttle, aileron, elevator, and rudder, for the 2049 possible stick values recognized by OpenTX, which range from -1024 to +1024. When each stick value is detected the corresponding screen pixel is set, and slow, careful movement of the sticks will eventually produce a display of which positions are detectable and which are not. Pressing MINUS (-) will clear the screen and restart the test, and long-pressing EXIT will exit the screen. The vertical lines in the display each consist of four line segments, one for Thr, one for Ail, one for Ele, and one for Rud. The left segments indicates that the value of -1024 was reached, the center segments indicates that zero was reached, and the right segments indicates that +1024 was reached. 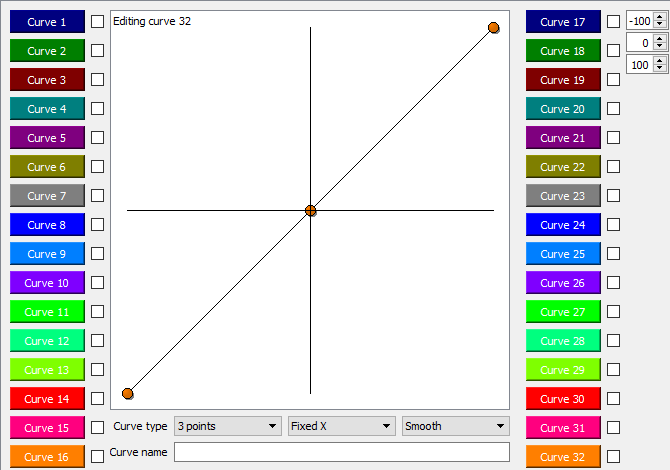 All other positions are indicated by individual pixels, with the negative values represented on the left side of center and the positive values represented on the right side. You can see in the image above that when the script was run on Companion simulator the center segment for Thr did not appear, indicating that a zero reading from the throttle stick could not be obtained. Hobby #1: Programming my Taranis for R/C gliders. Hobby #2: Flying R/C gliders.